When we arrived back to North Grounds for this semester not much had changed. The Law School is still always either really hot or really cold. Mandy is still stirring up caffeinated drinks in ScoCo, George Geis is still looking gooooood, and the 1Ls are still sitting four-to-a-table in the library. However, there was one huge change. The beloved Villa Diner, which closed briefly at the end of last school year, had reopened in a new location on US-29. As a consistent patron of Villa Diner and lover of breakfast food, I was nervous and excited about this big move. The Villa’s former, unhurried location. Photo courtesy The Cavalier Daily. 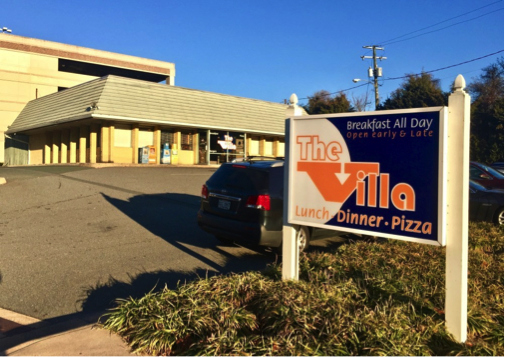 The UVA Foundation owns the property where the Old Villa (hereinafter “OV”) was located and recently decided to terminate the diner’s lease to further development plans for the University. According to the Cavalier Daily, which interviewed Villa owner Ken Beachley, reported that Beachley and his wife were aware of the eventual demolition plans when they first purchased the diner back in June 2005, but were still upset by the news when the time finally came to relocate. So it is worth noting that the owners were perfectly content with the OV location. And so was I. My opinions about the big move stem from nostalgic tendencies and incurable impatience. The Villa’s new location - featuring “cleaner vibes” but longer waits. Photo Jill Rubinger / Virginia Law Weekly. At NV, the wait time has skyrocketed. I cannot tell if the new location has drawn a larger crowd or if there is simply less seating in the new building. If you’re going on a Sunday morning with a group of four, expect to wait thirty to forty-five minutes alongside the church crowd and the undergrads. Shanna Adler ’19 says she hopes to one day become such a regular that she can get a priority spot in the diner to avoid this hassle. There is a larger waiting area in NV, but that is simply because they need it now. Once seated, you can take in the ambiance of the new location. The tables are spread out and are more removed from the kitchen. This may be a positive feature to many people, but I kind of like it when I am seated close to the kitchen in a diner. This is probably why I enjoy Waffle House so much. There are definitely cleaner vibes at NV. According to Winnie McBride ’19, a Triple Hoo and Villa expert, the restaurant feels clean and has better natural lighting. I would say that the biggest differences between OV and NV are procedural in character. The substantive stuff hasn’t changed. The food is still delicious and the staff still wears royal blue collared shirts sporting the diner’s logo. There are still paper place mats at the table featuring a fun-fact-filled illustrated map of the state of Virginia. The menus are the same, and I still order the Super Big Complete Breakfast every time I go. All in all, it’s still the best quick diner in Charlottesville. Just be sure to factor in a few extra minutes of wait time before your next trip.